In a recent Washington Post piece, I discussed my analysis of the American National Election Studies database suggesting that young people are indeed more progressive than older generations. But they've yet to have a large effect on our politics, and one reason is because they simply don’t vote. Thus, progressives must take seriously the importance of registering and mobilizing young people, an increasingly important demographic. 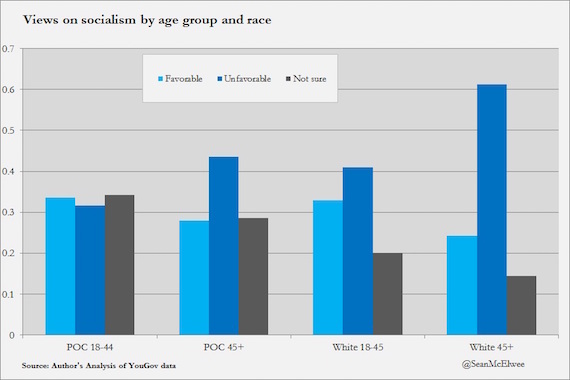 To examine the views of young Americans, YouGov assistant editor Peter Moore provided me with data from their recent survey on socialism, but with age and race crosstabs. The chart below shows the distribution of "favorable," "unfavorable" and "not sure" responses. As the chart shows, young people are indeed more supportive of socialism, but they are also more likely to be unsure about it (indeed, among young people of color, “not sure” is the most common response). There are also racial divides, with people of color tending to have a more favorable view of socialism. To see whether this is simply a youthful fad, or whether there have been deeper shifts in attitudes about government, I examined the 2012 American National Election Studies (ANES) survey question that most similarly resembles socialism. The question asks respondents to place themselves on a 1 to 7 scale with 1 being “government should see to a job and good standard of living” and 7 being “government should let each person get ahead on own.” I examined the percentage of respondents in each demographic group who placed themselves on the scale from 1 to 3. I find that young people are more progressive, and that this is true across race, class and even partisanship. In addition, ANES asks questions designed to explore a respondent’s views on free markets versus government intervention. Young people are more likely to agree that “we need a strong government to handle today's complex economic problems,” rather than the “free market can handle these problems without government being involved.” On question that asks respondents whether they agree, “the less the government the better” versus “there are more things the government should be doing,” the majority of young people see more that government should be doing, while nearly two thirds of older folks say “the less government, the better.” Another question asks whether they favor, oppose or take no position on the government reducing income differences. 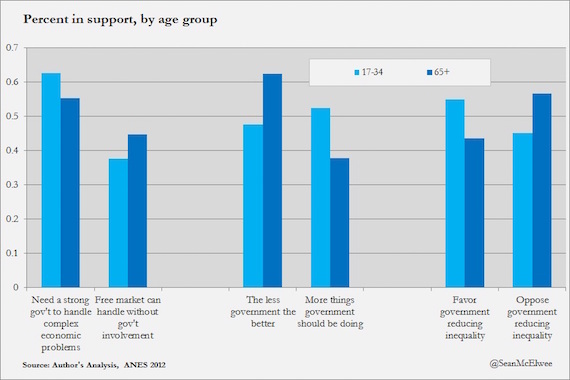 Of those who take a position (that is, neutral respondents excluded), the majority of young people support government reducing income differences, while the majority of respondents in every other age category oppose government intervention. It’s obviously an open question as to whether this remains true as young people age, and there is some support in ANES for Emily Ekins’s assertion that higher income young people are less supportive of redistribution. Higher income young people are more likely to say “government should let each person get ahead on their own” (though young people with high incomes are less likely to agree than older people with high incomes). While 49 percent of young people with an income under $30,000 placed themselves on the scale nearest to government seeing to jobs and a standard of living, only 34 percent of those with an income over $100,000 did. Similarly, 28 percent of low income young people placed themselves closer to government should let each person get ahead on their own, compared with 45 percent of high income young people (the rest were in the middle). It’s certainly true that class divides will likely remain important in the future, but voting patterns will likely help determine whose views are represented. Deregulation, privatization, financialization and austerity have all dramatically diminished the power and influence of government to provide a decent standard of living for Americans. Unions have been weakened, and the effects are palpable. A recent survey suggests that young people are far less likely to have employer provided health care, but more likely to get free food at the office. Millennials are saddled with debt which will drag down their wealth, but seeing very little opportunity for upward mobility. These shifts have harmed women and people of color the most, and unsurprisingly, young women and people of color are most likely to support a robust role for government intervention. However, the impact of young progressives will only be fully realized when they turnout to vote. 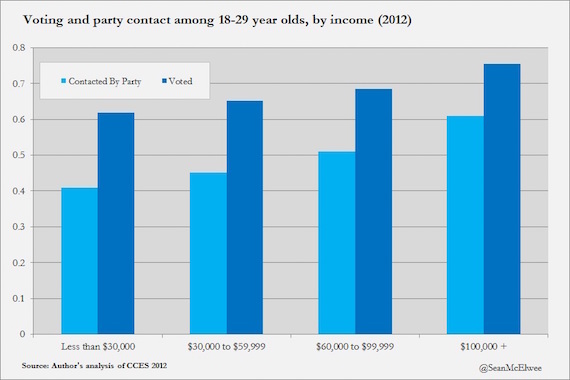 But young people are far less likely to be registered than older Americans, and far less likely to be contacted by parties. Within the millennial generation, there are mobilization gaps, with higher-income young people being more likely to be targeted for voter mobilization and turnout to vote. The solution is for all Americans to be automatically registered to vote, which will make them more attractive targets for mobilization. Young people are indeed more progressive, the problem is they aren’t voting. And policy is determined by who shows up.